WHAT IF a man with a rifle, mask, and body-armor entered YOUR church, mall, or theater?" The question is serious, "WHAT IF a man in with a rifle & mask entered YOUR church, mall, or theater?" In law-enforcement circles, such a threat is called an "Active-Shooter", and if such a threat appeared, & his intent was clearly bad, would you KNOW what to do? As we watch the news it becomes obvious that things like this ARE happening in unexpected places, and that America has enemies promising to increase such threats. But to KNOW what to do? No, most likely NONE of us would be certain what the best solution would be in a given situation, there are just too many variables and the situation is far outside scope of our experience. Still, there are some simple answers, advice from experienced professionals, which can help us evaluate such a situation, weigh the risks, and make good choices about how best to keep our families alive through such an ordeal. FiveC has compiled a wealth of advice & information from trustworthy sources, and we want to share it with you. 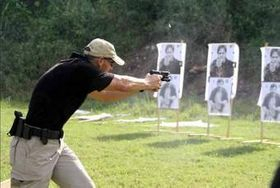 We've developed a curriculum where that information can be discussed, and hands-on firearm training can be applied, all in the space of about 3 hours! - the risks of engaging the "Active-Shooter"
This course is open to anyone with a concealed carry or weapons permit. We will run a 'hot' range, with firearms loaded & ready, but for safety, these will remain holstered until specifically directed by our Range Officers. 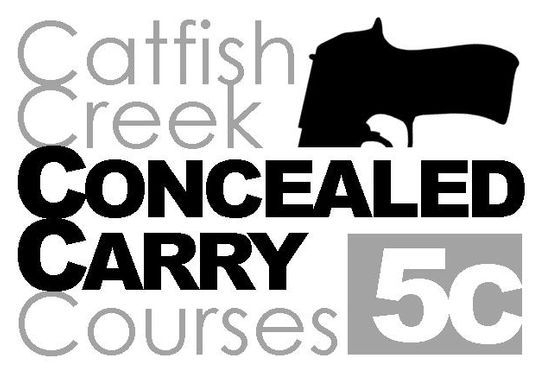 Come prepared, with a range bag and appropriate safety gear. Cost for this course is just $60 per student. Expanded versions of the course are available for private groups (call for details). 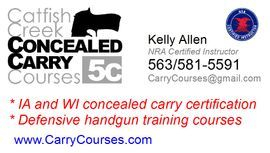 This is an ideal course to help current permit holders meet IOWA requirements for RENEWAL of their Weapons Permit.